Proper dental hygiene is a basis of all dental specializations. Regular visits at dental hygienist can prevent peridontal disease and subsequent tooth loss. During the visit at dental hygienist the teeth are professionally cleaned, plaque, tartar and tooth discoloration are removed. During the visit the sources of bad breath are identified and removed. 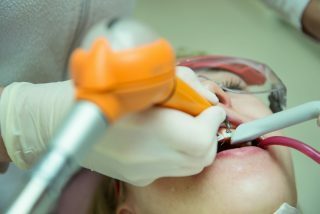 Apart from that a dental hygienist gives instruction on how to take care of the teeth, how to clean them, what bad cleaning habits should be omitted and which accessories should be used. The aim is to create an individual dental hygiene program for each patient, which would allow everyday teeth cleaning, which is of high quality and gentle at the same time. We recommend to visit dental hygienist regularly twice per year, so that the negative changes, which patient cannot identify, could be identified. Only proper and regular tooth care can guarantee long-term teeth health without caries and peridontal disease. Do not hesitate to book your visit.